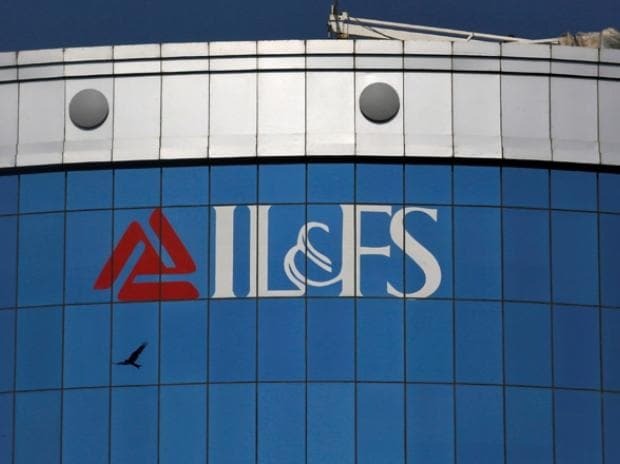 The National Company Law Appellate Tribunal (NCLAT) on Monday ruled that accounts of Infrastructure Leasing & Financial Services (IL&FS) and its subsidiaries could not be classified as non-performing assets (NPAs) without approval from the tribunal. “Without going into the rival contention of the parties, we make it clear that due to non-payment of dues by the IL&FS or its entities including the amber companies, no financial institution will declare the accounts as an NPA without prior permission of this appellate tribunal,” a two-judge Bench led by Chairperson Justice S J Mukhopadhaya said. The Reserve Bank of India (RBI) had earlier told banks to declare some accounts of the group NPAs. Now, that directive will be on suspension. The central bank did not want to comment on this. The outstanding loan of the IL&FS group is about Rs 60,000 crore, while the debt is over Rs 91,000 crore. Hearing a plea moved by lenders, the Bench observed that the step was being taken in the interests of the resolution plan being carried out by the new board of IL&FS. On February 11, the central government and the new board of IL&FS had submitted an affidavit detailing three categories — green, amber, and red. Sixty-nine firms of the group have been classified under these categories based on their ability to service routine debt obligations. Those companies which had no cash were classified as red. Those with enough to pay secured creditors but not unsecured ones are amber. And, those in no position to pay any creditor are red. The NCLAT has allowed green firms to service debt obligations. One of the companies classified as amber is IL&FS Tamil Nadu Power Company. PTC Financial Services (PFS) filed an intervention application claiming that IL&FS Tamil Nadu Power Company should be categorised as green. On February 22, PFS filed an application with the NCLAT seeking temporary dispensation of the asset classification. The tribunal heard this matter on Monday, and asked all financial institutions and non-banking financial companies to not classify the amber firms as NPAs. This has prevented the deterioration of assets to NPA. These are now standard. Of the subsidiaries of IL&FS, 170 are domestic companies and nearly 133 are incorporated outside India. Due to the large number of intervention applications, the National Company Law Tribunal reserved the decision for the amber category entities and listed March 12 as the next date of hearing. The NCLAT had, during the last hearing, lifted the moratorium placed on these companies and allowed their resolution plan to go on as planned. Hearing an urgent petition moved by the Ministry of Corporate Affairs, the NCLAT had on October 15 last year stayed all proceedings against IL&FS and its 348 group companies till further orders. The moratorium, the two-member Bench had then said, was being placed “taking into consideration the nature of the case, larger public interest and economy of the nation and interest of IL&FS and 348 group companies”. 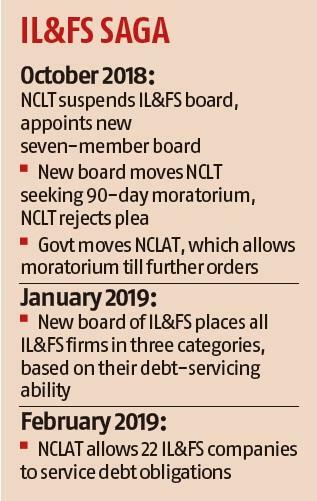 The NCLAT has also temporarily suspended the acceleration of any term loan, corporate loan, bridge loan, commercial paper, debentures, fixed deposits and any other financial facility by the IL&FS and its group companies. The ministry had moved the appellate tribunal after a plea for moratorium was rejected by the Mumbai Bench of the NCLT. The government, in its initial application filed before the NCLT, had sought three months’ moratorium over “institution or continuation” or any other proceedings against IL&FS and any of its group companies in “any court of law/tribunal/arbitration panel or arbitration authority”. The NCLAT had, in its October 15 order, made it clear that the interim moratorium order would not be applicable to any writ petitions before high courts or the Supreme Court.